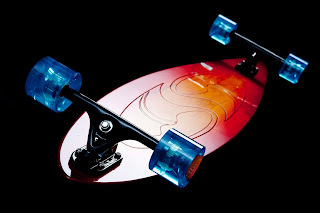 For years we have wanted to offer a board that would fit a more moderate budget but still have that Street Swell feel. It’s finally here. Introducing The Rocket, a 44” pintail that fits the bill. We use an 8 ply maple core and send it to our finishers where they work their magic. We have chosen the cherry sunburst finish for this board as on the Daisy Cutter. An integrated grip top and the Street Swell mark carved into the bottom insure there is no mistaking this for just another plywood deck. We finished the Rocket with Paris 180 trucks, Seismic Avalon 68mm/80a wheels and abec 7 bearings. Scheduled to be priced complete at well under 200 bucks, the Rocket is sure to be a hit. The Rocket will be on hand at the Teva Mountain Games so make sure to stop by the booth and check them out.